Not everyone’s Irish roots sprout from a thatched cottage behind a stone wall in a rolling green field. Plenty of people’s Irish ancestors were from the capital city Dublin, also known as the big smoke. Dublin has always been different than the rest of the island, which much teasing between the ‘jackeens’ in Dublin and the ‘culchies’ in rural Ireland. Ireland’s capital is a vibrant, modern city buzzing with chic restaurants and trendy boutiques. It’s also a city where you can’t help but be aware that with every step, you are walking the same ground once trod by James Joyce, Countess Markievicz and countless Vikings. 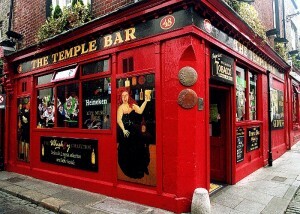 Some of Dublin’s most famous moments and characters are widely celebrated and memorialized. They appear on Irish gifts and souvenirs. You can visit the GPO on O’Connell Street and see the bullet marks in the columns from the 1916 Uprising. You can learn about the Vikings with a Viking Splash tour or a visit to Dublinia, the Viking museum. But what is beneath the surface? If you’re curious about Dublin beyond the tourist perspective, read on. Croppies Acre – On the River Liffey’s quays, right in front of Collins Barracks National Museum is a fenced off parcel of land with no big sign to identify it. But all Dubliners know it is the Croppies Acre. It is the site of a mass grave for the men of the 1798 Rebellion, who were known as the Croppy Boys. Dead Zoo – The famous Dublin wit shows itself in this nickname for the Museum of Natural History on Merrion Square. It might not be a highlight for many tourists, but visits here have been an essential part of childhood for generations of Dubliners. Conkers in Phoenix Park – You don’t see horse chestnuts pictured on many Irish gifts, but before the arrival of video games, Dublin children were eager to visit the Phoenix Park in autumn and stuff their pockets with the best horse chestnuts in town. Once home, they would drill holes in each nut and thread a piece of string through them. The game is for two opponents to swing their chestnuts into each other to see which one breaks first. Ha’penny Bridge Toll – Dublin’s most iconic bridge features in countless tourist photos and Irish gifts. But do you know how it got its name? Long ago, it was a toll bridge and the charge was half a cent – a ha’penny. Moore St – This lane just off from the famous GPO is full of street vendors and little shops with goods from around the world. It’s also where the leaders of the 1916 Uprising retreated when they lost the GPO to the British. The house where they regrouped and conducted the surrender negotiations has been the subject of great conflict recently between developers and local activists who want to preserve it. Famous people you don’t know are from Dublin – You might be able to rattle off dozens of famous Dubliners, but did you know that Bram Stoker, Oscar Wilde, George Bernard Shaw, Samuel Beckett, Francis Bacon, and the first lion to star in the famous MGM film logo were also from Dublin? Now the next time you visit Dublin, read about it or purchase Irish gifts linked to the capital, you will have even more insight and understanding of the city’s rich culture.